Neutron radiation detector BDN performs the following functions: measurement of DER of neutron radiation in collimated radiation by Pu- α -Be, search and registration of neutron radiation sources. 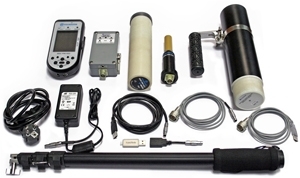 BDN can be used by radiological and isotope tracing laboratories, customs officers, emergency services to search and detect neutron radiation sources and to continuously monitor radiation environment. BDN is connected to the Spectroscopic Radiation Monitor PM1403, Display and Control Unit РМ1403 and Display and Control Unit РМ1403-01 or a PC via RS-485 or USB. Operation algorithm enables continuous measurement process, processing of the measurement results and quick adaptation to radiation intensity changes. BDN enables recording of data into the non-volatile memory, continuous control over the DER threshold level, sound/visual alarm if the set DER level is detected or exceeded.